The Metro Development Center on Fifth Street near Muhammad Ali Blvd. 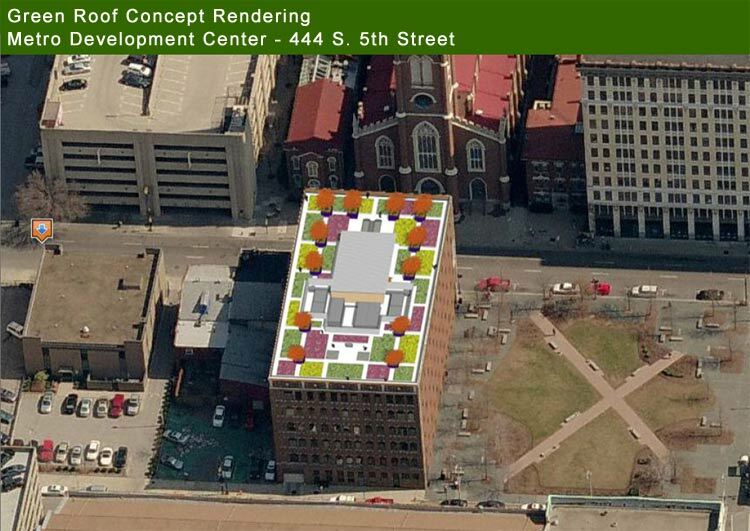 is about to become the first Louisville government building to sprout a green roof. Construction began in September and is scheduled to be wrapped up in the next couple weeks, ahead of an estimated December projection. The new roof is expected to reduce energy costs and improve insulation on the six-story former parking-garage-turned-office-building. Other side-effects of the new roof include absorbing rainwater to ease pressure on overcrowded storm sewers, reduce the heat-island effect of urban areas, effectively cooling the city in the summer, improving air quality, and providing additional habitat for birds and insects to increase the biodiversity of our urban environment. Louisville has been trying to become a leader in the sustainable ‘green movement’ through its Go Green Louisville initiative. The new green roof on the Metro Development Center will prove to be a tangible result, propelling Louisville ahead of some of its competitor cities. Charlotte recently delayed their plans for greening the city while Indianapolis just last month announced their first government sponsored green roof. Cincinnati appears to be ahead of the curve, however, as it recently announced plans to offer grants for new green roofs on private developments. The city already has several functioning green roofs to speak of. Chicago is the clear leader of the green roof movement. Metropolis magazine pointed out that in 2001, a green roof installed on Chicago’s City Hall was the country’s first municipally sponsored project. Louisville has been putting green roofs on parking garages for decades now. The Belvedere, though swampy, and the Muhammad Ali Center Plaza are excellent examples of how Louisville has inadvertently jump started its green roof leadership. The roof on the Metro Development Center is intended to be an experimental example to promote the method to the community, so hopefully it will inspire developers and homeowners to build green roofs of their own. The city is also working on an inventory of other government buildings that might be suitable for green roof installation in the future. Louisville’s newest green roof will cover 13,400 square feet and will be planted predominantly with native grasses and sedum, a succulent that stores large amounts of water in its leaves making it drought tolerant. Several hawthorn trees will sit in planters above structural support columns between the beds to provide shade for the plants. The Metro Development Center was an obvious choice for the city’s first green roof project. The building was originally built as the Lincoln Parking Garage and later transformed into offices in the 1980s. As a garage, the building is over-engineered, meaning the roof can more than support the weight of a green roof. And this one is going to be heave. Installation is being carried out by the Zero Company, who estimates the completed roof weighing in at around 160 to 165 tons. Design of the roof was done by Luckett & Farley Architects. The energy savings provided by the green roof will be tracked by a special software program and an irrigation system will be installed in case of severe drought. Plants are selected for green roofs for their natural drought tolerance, so it is unlikely the irrigation system will be frequently used. Unfortunately, the new roof will not be open to the public as it is not handicap accessible, but the end result will certainly be visible from surrounding buildings. Plants are scheduled to begin arriving on site tomorrow and contractors expect to have everything done in just a couple more weeks.